Epic fantasy classic Golden Axe is now available on mobile! Play free and rediscover SEGA’s ultimate hack ‘n’ slash masterpiece. Erm, there are in app purchases. There's a whole load of sega megadrive ports for free in addition to this like Sonic 2, and Altered Beast off the top of my head. Pretty awesome. Why is the minimum inapp purchase £1.99! I bet it wasn't 48mb on the mega drive. Here's an idea - i just called this number from skype and whispered "it's done, leave the money where we agreed but there's blood everywhere, it got really messy". Is that HDR 10 bit? 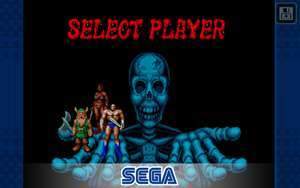 Are any of the sega bundle compatible? I got all these classics on my MAME emulator which I believe are the Arcade versions, all with built in cheats, not that I use them, he says!! Is Sega paying for these ads? The controls are pretty shocking! Does it play in 4k? You can install No Root Firewall and block it from accessing wifi/data thus no ads. Installed last night and it drained 43% of the battery over night (Note 8). You have been warned. Uninstalled! You can install No Root Firewall and block it from accessing wifi/data …You can install No Root Firewall and block it from accessing wifi/data thus no ads. Yep, I tried my best but can't get far......uninstalled! Ditto....sick of seeing these kind of rubbish deals.